Despite calls for Jay Z to withdraw from a deal with high-end retailer Barneys New York after two racial-profiling accusations, the rapper’s luxury-clothing line raked in more than $1 million over the holidays, the Daily Mail reports. All profits made from sales during the six-week limited run will be donated to Jay Z’s Shawn Carter Foundation, which provides college scholarships for underprivileged kids. Barneys has also promised to give 10 percent of the store’s profits from the first day of the sale to the foundation, according to the Daily Mail. It was initially unknown whether the launch of the goods would be a success after there were public demands that Jay Z speak up about the racial-profiling cases that had been filed against the store, with some even suggesting a boycott. Back in October, trouble started to brew after a teenager was arrested by the New York City Police Department after purchasing a $300 belt from the store. He was accused of fraud, even though he'd used his own debit card. A day after that incident blew up in the press, a woman came forward, claiming that she, too, had been profiled after purchasing a $2,500 bag. 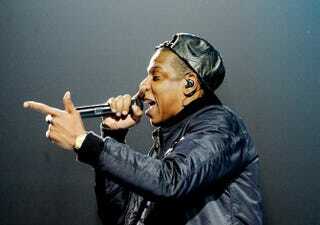 Jay Z did eventually address the controversy, saying that he wouldn’t back down until all the facts were known. He wrote in his blog, "I am against discrimination of any kind, but if I make snap judgments, no matter who it's towards, aren't I committing the same sin as someone who profiles?"